Before I proceed into the conversation that's prompting me to write words for such a tragedy, I want to first take a moment to wish all of those who find themselves caught within the waters that are currently drowning the greater Houston metropolitan area, the best of luck in navigating those floods and rains that currently bear down on your homes, communities, and way of life. And to my family, mom and dad, who live in Houston, I love you and hope you continue to remain safe throughout the storm. I find myself having difficulty putting thoughts to words as the devastation of Hurricane Harvey continues to drown a city that I've come to care for. As such, it's hard to take a step back to rationally process how the current events that unfold before our very eyes came to be. I find this to be true even though I'm not one considered to be in any imminent danger. Emotions run high when terror strikes. And it seems that this terror of widespread flooding and unprecedented downpour is becoming more and more common as states such as Missouri, Wisconsin, Arkansas, Indiana, and now Texas, get added one by one onto the list of communities who have been dealt unprecedented levels of devastation as their respected floodwaters rise. But taking that essential step to reflect on the mechanisms of causation is imperative, if we wish to take the necessary steps to insure that a probability for the repeatability of calamities such as these is minimized in a manner that is logical, agreeable, and effective. There are points to consider here that are both scientific and political, and the first step to approaching this situation intelligently requires us to make sure our catalogue of causations is not incorrectly sorted. As an educator, I want to focus on the scientific aspect, as these elements are only debatable by the ignorant. Science is true, whether or not you believe in it. Atmospheric water concentration increases as a function of temperature. The basic concept correlating temperature to vapor pressure can be found in any general chemistry textbook (for example, General Chemistry by Ebbing, Chapter 11 Section 5). To summarize though, increasing the kinetic energy (I.E. Temperature) of liquids increases the number of molecules with sufficient energy to vaporize. This equilibrium reaction between water in a liquid state and water in a gaseous state pushes towards the latter state as you increase the temperature of the system. And the greater the potential to hold water in the atmosphere, the greater the capacity for storm systems to drown cities such as Kansas City, St. Louis, and here, Houston. The National Oceanic and Atmospheric Administration, NOAA, has data stations out in the middle of the Gulf of Mexico that record data sets, such as air temperature, on a consistent basis. One such station, NOAA station 42002 east of Brownville, TX, has been online collecting data points back since 1973. This data station was along the general path of this week's hurricane. The blue dots presented above are raw data points. I arbitrarily picked today as my reference point and consistently extracted every temperature reading taken at midnight from 1973 to 2016. 1975, 1976, 1982, and 2011 had no correlating data that fit the initial parameters and as such do not appear above, and I removed outliers corresponding to 1985 and 1991 in order to not skew the overall data trend in one way or another by a single extreme point. The Red line demonstrated therein is a linear regression with a calculated first derivative of 0.141 deg/yr. The data shows that over the last 43 years the average air temperature of the NOAA station 42002 increased by over 6 degrees Fahrenheit. That fact alone should be worrying, considering how the Gulf of Mexico plays such a vital role to the functionality of our nation. But even more so it is concerning because in this particular situation, these new quantities of energy have the potential to feed power back into future storm systems like Harvey in ways so to ensure continued destruction of the communities that exist along the Gulf. Given that the heat of vaporization of saltwater is around 41.99 kJ/mol according to extrapolations from data available via MIT, such values in conjuncture with the data provided from NOAA demonstrate that over the course of the last 43 years the partial vapor pressure of water in the atmosphere over the gulf increased by approximately 20%. Now these are fairly rudimentary calculations and extrapolations we've demonstrated here, and we've only examined one out of the many data sets provided by the National Oceanic and Atmospheric Administration. But make no mistake: in a world of causality, what we do to affect our environment has repercussions. Allowing the world to continuously heat without addressing the reasons for such (see research out of NOAA, NASA, etc.) is a failure to observe the data. It's a failure to understand. 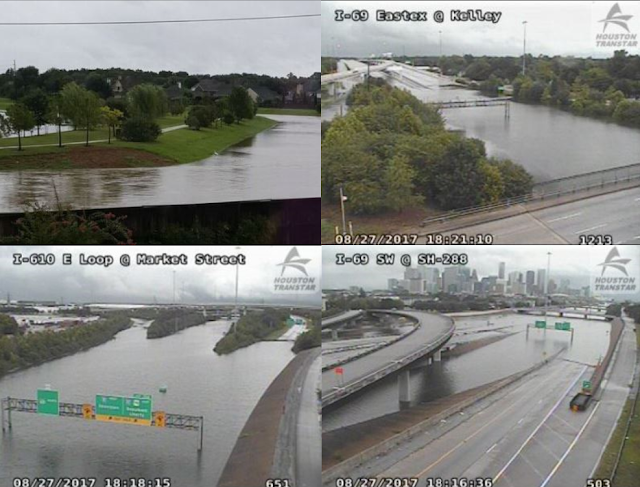 Regarding Houston, these extreme events are going to continue to increase in both occurrence and ferocity, as it has been predicted for decades, while the forcings that drive these extreme weather patterns continue to grow. And until we as a nation recognize the the very real problems that drive these phenomena, events such as Harvey will continue to bring death and destruction to both Texas and beyond. Target Atmospheric CO2 : Where Should Humanity Aim?